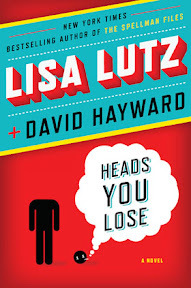 Head You Lose [Book Review] – my books. my life. Crime writer Lisa Lutz asks poet David Hayworth to co-write a murder mystery with her. As they write every other chapter about Paul and Lacy, pot-growing siblings who discover a headless body on their lawn and start investigating the entire town, they take out past aggressions (there is some romantic history) on their characters and more and more townspeople die. This is one entertaining book. There is a real murder mystery here, but watching Lisa and Dave battle it out on paper means it is twice as interesting as it unfolds. Since the story never remains firmly in either authors’ control, it quickly becomes a convoluted mess of a story that zigs and zags and actually keeps you guessing (the authors too). People die then come back to life. Twists are taken that end up leading nowhere. Characters develop conflicting personalities. And then the authors call each other out on it. It really is hilarious. I’m not a murder mystery reader but I think all readers would like this one. It actually made me wonder if this is how every book is written to some degree – do authors always know where the book is going or does it get out of their hands at times? I highly recommend this one when you need a laugh. I bought this book after reading Jenners’ amazing and hilarious review, and just happened to mention the book to my husband over the weekend. It does sound like a really fun read, and I bet that the tensions between the authors just makes it all that much more interesting. Must make time for this one. It sounds like I will have a great time with it. Thanks for putting it on my radar once again! Aping Heather’s comment…Jenners review completely convinced me I must read this. Of course I haven’t yet, but I have good intentions. Which of course my life’s road is paved with. I giggled my way through this book (with a couple spots where I was laughing so hard I had to put the book down until I could regain control). I then gave it to The Hubster and got such a kick out of him giggling while he read it. The commentary to each other between the chapters was an absolute riot. How interesting that you’re not usually a mystery reader but that you enjoyed this one a great deal anyway: that speaks well of it for sure!